Holiday treats and sweets happen to juxtapose themselves into one of my favorite things, yet one of my biggest enemies of the holiday season. 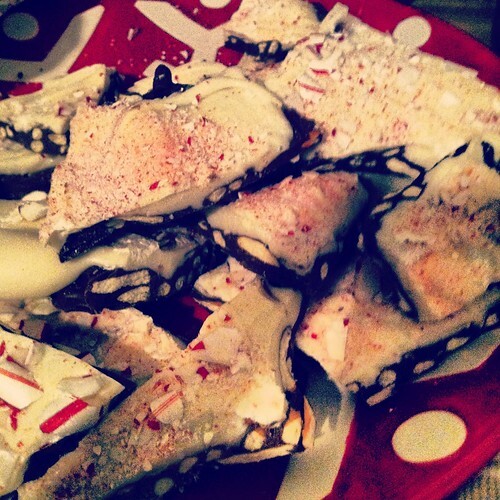 Nevertheless, peppermint bark sneaks by any guilt I might have and wins every year. Scrolling through Pinterest for inspiration towards my contribution to this year’s Secret Santa party amongst friends, I stumbled upon a slight twist to the traditional peppermint bark recipe. The recipe below is not only simple, but quick as well! Approximately 1 cup broken pretzel sticks (I used the stick variety and broke them into 3-4 pieces; however, you can use any type of pretzel). Using a double boiler, melt the milk chocolate chips over the stove. Mix in the pretzels and immediately spread on a non-stick cookie sheet. Place in the freezer for about 15 minutes until hardened. Melt the white chocolate chips in a double boiler on the stove and mix in peppermint extract. Immediately spread over hardened milk chocolate mixture and sprinkle crushed candy canes over top. Stick back in freezer until bark is hardened (about 20-25 minutes). Use sharp knife to break bark into pieces to your liking! What is your favorite holiday sweet treat? Thanks for sharing your holiday recipe favorites. It is nice having a few quick and easy recipes around to help things go smoothly.